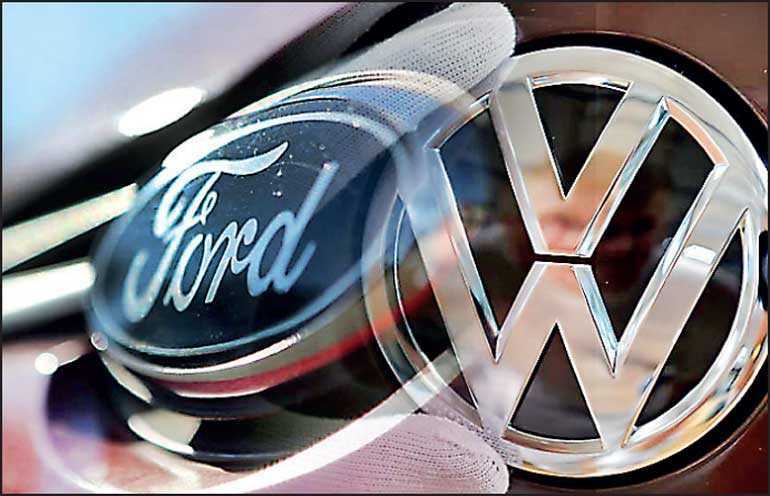 DETROIT, AFP: Volkswagen and Ford announced Tuesday that the automakers had agreed to an alliance to jointly develop commercial vans and pickups starting in 2022 in a bid to reduce costs. The announcement came after more than six months of talks between the car giants which has also included discussions around autonomous and electrification technologies. The companies said they had agreed to “investigate collaboration on autonomous vehicles, mobility services and electric vehicles and have started to explore those opportunities.” The deal reached between the American and German automakers to develop commercial vans and medium-sized pickups as early as 2022 does not involve cross-ownership, according to a joint statement. VW CEO Herbert Diess said the alliance “will be a cornerstone for our drive to improve competitiveness.” Under the alliance, to be governed by a joint committee headed by the chief executives of both companies, Ford will engineer and build medium-sized pickups for both companies. Ford will also build large commercial vans for European customers and VW will develop a city van. The alliance follows in the footsteps of others formed in the auto industry. Honda in October invested $2.5 billion in Cruise, GM’s proprietary technology subsidiary, in exchange for a 5.7% stake. Toyota and Mazda plan to open a joint factory in the southern US city of Huntsville, Alabama in 2021.